Although based in sunny LA, Anne Ross also has an affinity for Amsterdam, which is considerably more grey this time of year. 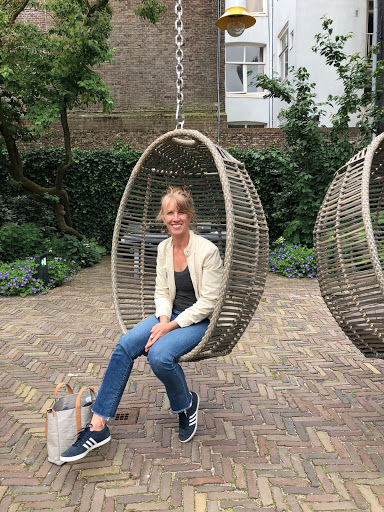 We caught up with her shortly after she wrapped on a project in Amsterdam, and she shared some of her favorite things about the city. TP: Where did you find inspiration while working in Amsterdam? AR: Walking, walking, walking! It’s amazing what you can observe just by walking and of course, bicycling. In Amsterdam, I had a few shops in mind that I wanted to explore as well as a yoga studio I wanted to visit during my prep time. I planned out my map so that I would walk the longest route to allow for any unexpected treasures to arise. This took me past museums, second-hand shops, design boutiques, and local treasures. In particular, I loved Pompon Flower Shop and Hay Design. I also really liked Sissy-Boy - their clothing options are cute, but I really loved their home goods even more than the clothes. Then, of course, there’s Hema - who doesn’t love to find the local Target? With limited time, I knew I couldn’t necessarily visit the museums, but by walking through the crowds, or experiencing the street musicians out front, I was able to get such a wonderful feeling for the locals, the different neighborhoods, and the best tourist attractions. It was a great way to get a feel for the city in a limited amount of free time. The crew was fantastic and all had the same mindset to explore whenever possible. Together, we enjoyed different cuisines, used the canals as a mode of transportation home, rented bikes, and reveled in the architecture. TP: Where did you stay while you were there? AR: I stayed in the Hoxton which was cool, but I loved the Pulitzer Hotel. It is such an inspiring place to wander through and appreciate the architecture, design, and craftsmanship in all aspects of the hotel. It spans several buildings, so the design elements linking the spaces were magical. It inspired me to always remember that no matter what you are doing, do it with all your heart; as if it’s the most important thing in the world. The dining room, the common areas, the bar, and the staff were all inspiring. I can still hear the sound of the ice in the martini shakers from the bartenders vigorous and consistent shakes! TP: Do you have any recommendations for areas of the city that are “must-visit” locations? The Nine Streets of Jordaan was my favorite area in Amsterdam. It’s fairly central so it's easy to rent a boat or find a cruise there. They also had lots of shops, restaurants, and hotels. Nearly every attraction is walkable or bikeable from there.